I AM IN L♥VE. Madly, deeply, addictively in love. Who, you may wonder, is the lucky object of my affection? Well, it’s not really a “who” – it’s a “what.” And that honor goes to an invention of my own creation: the Irresistible Chocolate Banana Coconut Smoothie. Look. You needn’t resort to name calling. And yes, I’m in love with a smoothie. If my childhood role models – like Pee Wee Herman – have taught me anything, it is this: “IF YOU LOVE IT SO MUCH, WHY DON’T YOU MARRY IT?” After witnessing Pee Wee’s marriage to fruit salad in 1987, I can say with confidence that the Irresistible Chocolate Banana Coconut Smoothie definitely is worthy of matrimony. While I work on creating my save-the-date cards, I would like to properly, formally introduce you to my new love. My raison d’etre. My motivation to rise and shine before my alarm awakens me. 3. Blend the ingredients for about 60 to 90 seconds. The symphony of mouth-watering taste opens with bold notes from the banana, coconut and chocolate, blending harmoniously to offer a lusciously rich flavor. The earthy, chewy texture – courtesy of the nuts, seeds and chocolate – makes this smoothie as substantial and indulgent as a gourmet dessert. Pair it with a cup of freshly brewed coffee, and the Irresistible Chocolate Banana Coconut Smoothie becomes the most sublimely satisfying breakfast to start to your day. Since I eliminated refined sugars from my diet, I only use 100% cacao chocolate. There is another, slightly embarrassing reason I use 100% cacao: I am a chocoholic. When I am in the presence of sweetened chocolate, which is more addictive than heroin mixed with crack cocaine, I can’t control myself. Put me next to sweetened chocolate during my special “lady time” of the month, otherwise known as PMS, and I look EXACTLY like Audrey Griswold in National Lampoon’s European Vacation. Here’s the beautiful thing about chocolate made from 100% cacao: It is delicious in recipes but on its own, a 100% cacao bar is bitterer than 1,000 lemons coated with a mixture of pure quinine and old coffee grounds. Try 100% cacao chocolate, and that bitterness will linger on your tongue until you scrub it with a Brillo pad. The flavor will make your taste buds cringe and recoil, leaving them wondering what they have done to forsake you. Thanks to this bitterness, I could stand next to a box of Ghirardelli 100% cacao bars during a tsunami of pre-menstrual hormones, and I wouldn’t give it a second glance. So if you’re a chocoholic like me, go with 100% repellent cacao. The “safe” chocolate preferred by 3 out of 4 recovering chocoholics. I like smoothies to be so thick and creamy that the mere thought of using a straw to drink it is laughable. I like smoothies that are as viscous as wet cement, capable of holding pruning shears in their full and upright position. I like smoothies that have more rib-sticking power than a bucket of roast pork and potatoes. To achieve this caliber of consistency, YOU GOSTA GET YO FREEZE ON, SON. There aren’t many ingredients in this smoothie that can be frozen ahead of time, so I recommend adding 5-6 ice cubes. I also highly recommend freezing your bananas in order to increase the smoothie’s viscosity. 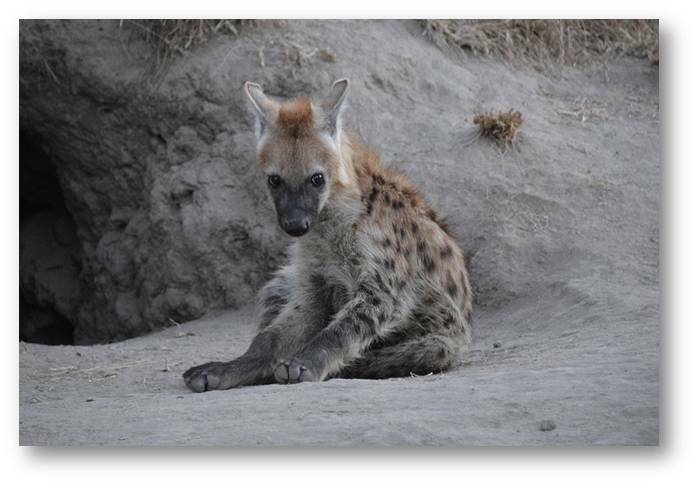 The best time to freeze them is when the banana skin is more speckled with freckles than an African spotted hyena. That’s when bananas achieve their highest level of sweetness. 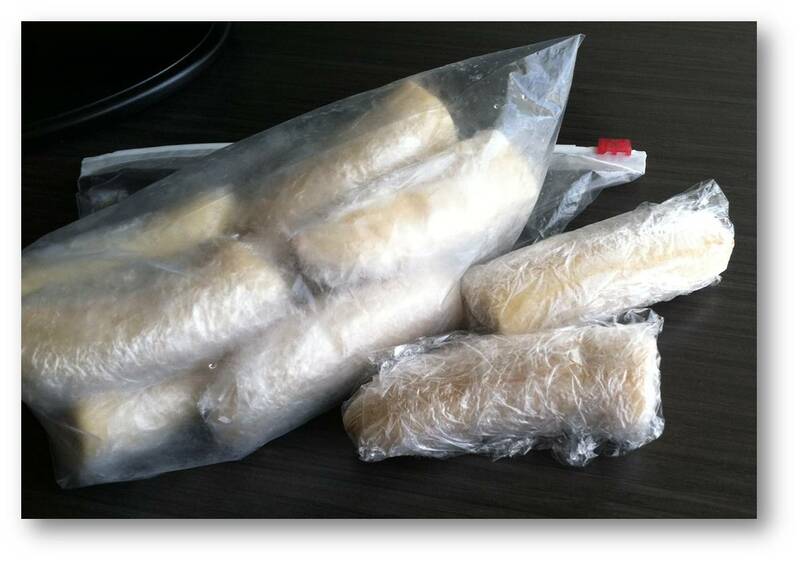 I peel them, cut them in half and then individually wrap them in cellophane before storing them in the freezer. When it’s time to incorporate these frozen beauties into a smoothie, I slice them up to prevent the hand mixer blade from seizing up. Helpful Tip: Don’t cut and freeze your bananas until the banana skin looks like a spotted African hyena. 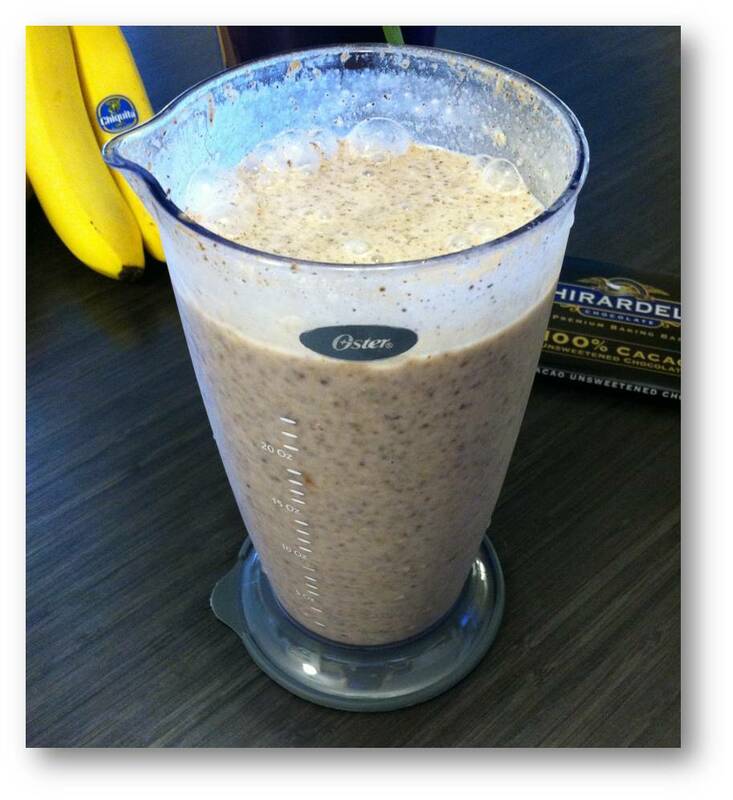 To give your smoothie a creamy, thick texture, cut, wrap and freeze bananas. If you have read other posts by Natalie and me, you know that we’re proponents of the 90/10 rule: Strive to make healthy choices to control hanger 90 percent of the time. What do you do with the remaining 10 percent? Whatever you want. Go nuts. Cut loose. Be naughty. Eat a slab of cheesecake dipped chocolate fudge, rolled in toffee. Or modify this I.C.B.C. Smoothie recipe thusly: Do not use the first five ingredients (chia, hemp and pumpkin seeds and walnuts and Brazil nuts); instead, replace those ingredients with five ounces of cold vodka. You think I’m kidding. Please. I don’t joke about the 10-percent rule. And I would never share a recipe with you that I have not tested myself; therefore, I want you to know that as I type, I am enjoying this 10-percent variation of the I.C.B.C. Smoothie. IT IS OUT-FREAKING-STANDING. Given the contortionistic flexibility of this recipe, I think my marriage to this smoothie is imminent. Oh! Oh! And would you look at this! Our save-the-date cards just arrived! Don’t worry – you’re all invited. 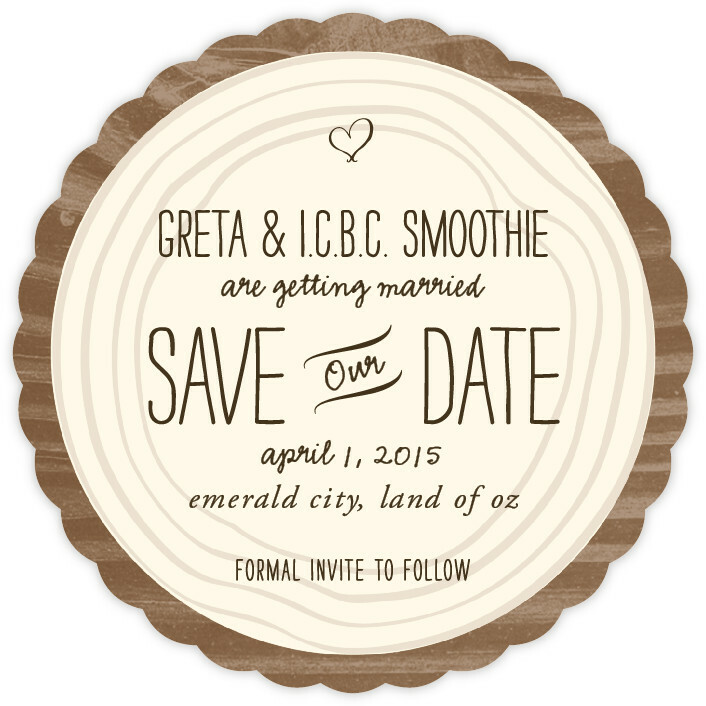 LOVE the SAVE OUR DATE Smoothie wedding announcement. Love the videos…shades of the past. I was in The Way Back Machine as I read the blog…that was FUN! The smoothie looks just as good as a 4,000 cal milk shake!